There's an upcoming day of SAGA organized by Eric Hagen. He puts on the best events including Adepticon's annual US Grand Melee. If he were to organize a "Rock, Paper Scissors," I'd sign up! This event is for Dark Ages warbands only and that left me scrambling. I'd sold off all my Dark Ages warbands so I decided to paint my Footsore Picts and run them as Scots. This is another reason I love SAGA. Few people can paint up all 30 factions but with a little planning, anyone can paint up a warband that can be played as 2, 3 or more other factions. Footsore Picts are superb sculpts just as we've come to expect. There is a lot of variety in the figures, faces, and poses. Even with a 48 warrior build, my Picts have a great, massed look. Bonus, Footsore is expanding their Pict line. They recently finished war hounds, cavalry, and crossbowmen. Still to come is a Pict warlord in a chariot! The naked fellows are the Attecotti and my favorite of the bunch. Bonus, when you order from Footsore you sometimes get art with your miniatures! 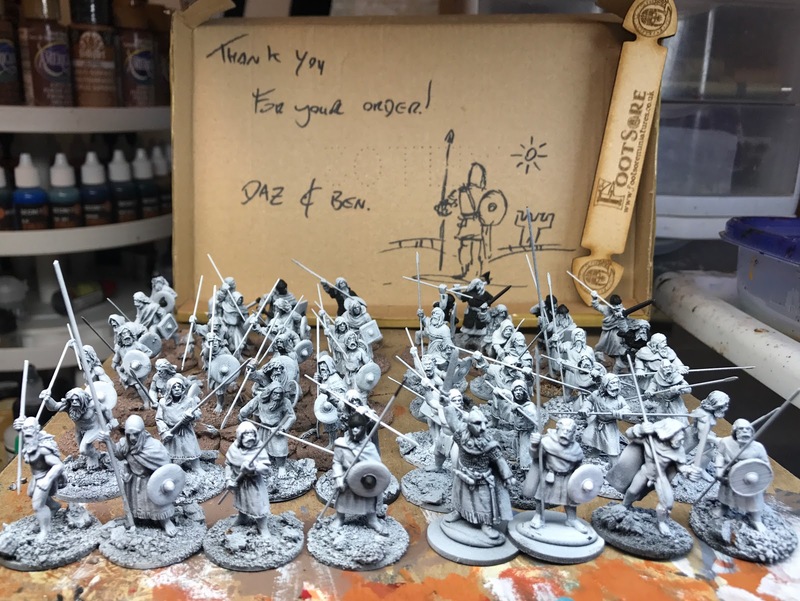 If all of this isn't enough to pull you in, you might be interested to hear that Footsore is working on a full line of Vikings and Normans too. Outstanding! With vibrant yellows and blues, these can only be from the hand of Monty! Yes, great looking warband. I'm sure the Saga event will be very successful. Thanks Dean and yes, these events are a treat. I only wish I could make it out to one of your West Coast events. One day! Excellent, they look fierce...and colorful! Phil, thanks! Yes, they do look fierce what with all the wild hair. Thanks John, this has been a great project. Really loving this warband. Ray! I've been so remiss on making the rounds. Thanks for your kind words! Brilliant as ever, Monty - you've really done these cracking minis justice! Thanks Evan, I appreciate it! Thanks Tamsin! I need to swing on by and see how many projects you have going all at once! They look superb Monty! And charging over the battlefield in all their naked glory I‘m sure they‘ll intimidate your opponents enough for an easy victory. Thanks! I'm a sucker for naked warriors. Its just crazy that people fought like that. They do stand out just a bit from the crowd. 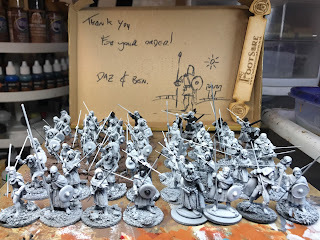 Lovely looking picts, footsore do great sculpts . Thanks Sum! Agree, Footsore is my go to figures for SAGA these days.